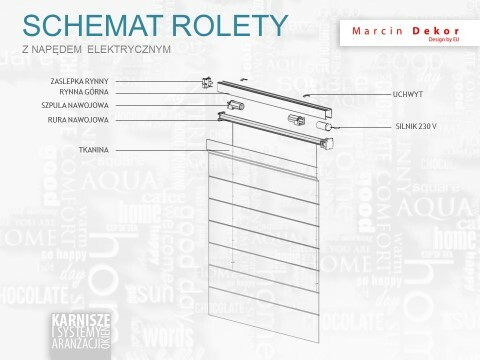 System of Roman shades with electrical drive guaranteeing exceptional comfort and easy use. Their great advantage is a method of control that allows us to control the blinds without the need to pull the propelling chain or cord. All we have to do is press the right button on the remote control or switch to start the drive. Frequently electrical control is chosen out of necessity, fox example in situations when blinds are located in hard-to reach places –such as great height, when their dimensions are spectacular or they are made of heavy fabrics. – or combined systems composed of remote controls and switches. 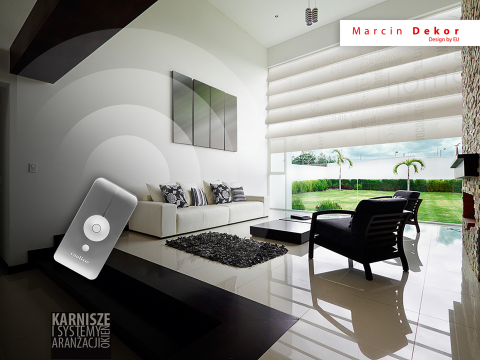 It is also possible to integrate the roller-blinds control system with intelligent building control systems. – motors with voltage of 230V with maximum lifting capacity of up to 15kg. It is worth noting that it is also possible to power the system with solar cells. An important and necessary action required in case of these systems is prior designing of an appropriate electrical installation during the phase of designing the interior. It is useful to contact the dealer beforehand and get additional information.